At Gillmorescamo our speciality is making custom fitted atv seat covers that fit exactly on your atv. Our custom fitted camo atv seat covers will fit on Artic Cats, Honda, Kawasaki, Polaris, Suzuki, and Yamaha. All of these 4 wheeler atv seat covers will fit exactly on your model. 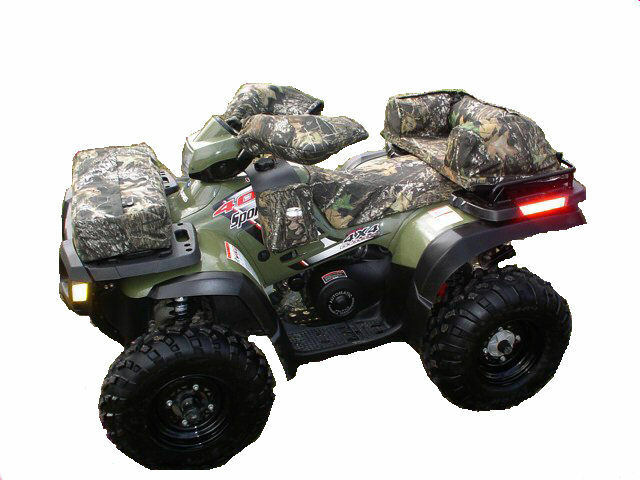 We make these custom atv seat covers using 600 denier mossy oak break up or 600 denier black and no tools are required to install these atv seat covers. We make several different camouflage atv accessories or black atv accessories. Some of these accessories are front and rear atv rack bags, atv rack pads, atv saddle bags, atv mitts, atv shock covers, atv tie downs, atv fender bags. Each of these atv accessories come in 600 denier mossy oak break up or 600 denier black. Our shadow grass boat accessories is made from 600 denier mossy oak break up. We make a boat seat cushion that will fit a boat gun box or a boat fishing rod box. We also offer a Mercury motor cover, and Mercury gas tank covers. This body blind is made of mossy oak break up. It has a facemask that can be worn over or under your cap and is made of mesh material. This item is great for turkey hunting. We make several different accessories that you can use on your powered parachutes. We make the ultimate super chute bag, line socks, the ultimate helmet bag, large saddle bag, the ultimate headset bag, small saddle bag, the ultimate radio holder, the ultimate com-pak, travel prop sock, and heat-up radiator cover. These products are made using 600 denier black and red. These items are great accessories for your powered parachutes.